PCB Design & Engineering Services - Freedom CAD Services, Inc.
Our Goal Is To Become A Seamless Extension Of Your Own Engineering Team To Provide Unparalleled Value With Our Relentless Passion For Quality, Performance, & Customer Satisfaction. Discuss Your Project with us Today. Request a Quote Online or Call us at 603-864-1300. It is the policy of Freedom CAD Services, Inc. to provide PCB design and support services that consistently meet, or exceed, our customer’s requirements, standards, quality, and expectations while maintaining regulatory and ISO 9001:2015 requirements and continuously looking for opportunities to improve our Quality Management System. Our people are our company. 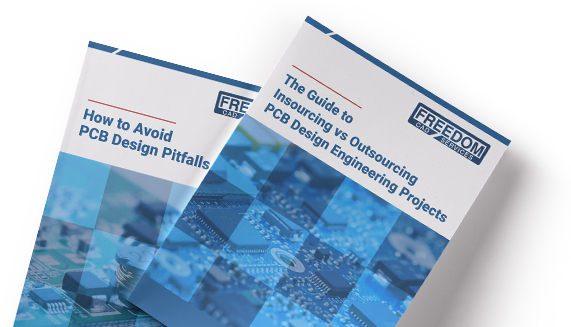 At Freedom CAD we believe in a team based approach to PCB design with a focus on continually striving to better ourselves both individually and as a company. We want to provide an atmosphere that promotes learning and advancing in an ever-changing field – something that benefits both our team and the customers we work with. We are committed to operating on advanced software suites and leading-edge hardware that take advantage of automation while providing our designers with the training and support they need to take advantage of it. To execute on that mission our designers are well versed in rules-driven, highly constrained, high speed, analog, power supply, military, medical and RF design technology, to name a few. We run on the Cadence and Mentor suites – the two highest-end design software companies in North America. In addition, our philosophy of using a teamwork approach toward projects allows us to align the right designer with the correct technology to meet your needs. We create teams for complex projects and match 1st and 2nd shifts to expedite work and meet customer demand. We are rich in history with a core team that has been together since the early 1990′s. The founders of Freedom CAD Services were also founders of Mosher Design Services and e2E Corporation, two successful and recognized service bureaus. Like those past companies that created the building blocks of what is now Freedom CAD, we are committed to upholding our tradition of providing the absolute highest quality design services and customer service available. Committed to Providing the Highest Quality Design & Engineering Services Available. Upload your data and RFQ details to get started.